Either one of two things will happen with Scott Richmond’s start today – it will go really really well, or Richmond will get lit up. I’m making this assumption based on Scott’s numbers in Spring Training games. I have faith in our boy, but I’m just not confident that he can put up similar numbers like fellow rookies David Purcey and Ricky Romero. It doesn’t help Richmond’s case that the Blue Jays have had a terrible record against the Cleveland Indians over the past few years. Call it the “Curse of Rick Vaughn” if you will, but for some reason the Indians have a knack for keeping the Jays at bay. In fact, there was a 4-game stretch last year where the Blue Jays couldn’t even put a run on the board for over 3 straight games. If you remember, that series itself was the beginning of the end for John Gibbons as the Blue Jays coach. 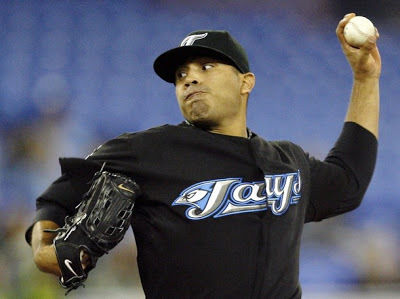 But despite all those things, I wish nothing but the best of luck for the Blue Jays brand new fifth starter, Scott Richmond. His leash will no doubt be very short, and will have to start out of the gate strong and make a good impression in his first few starts. As the Jays fifth starter, Richmond is the lowest on the totem pole, and can be replaced at a moment’s notice. Regardless, I’ll be sitting down later today with a nice refreshing glass of Kool-Aid to watch Scott Richmond hopefully spoil the Cleveland Indians home opener. I still think Richmond is best suited to a long-relief role, but I think he should be able to give us 5 decent innings vs. the Indians. A good showing today, and I might drink the Richmond Kool-Aid! A good showing today, to take the Jays to 4-1, and I might get drunk on the Kool-Aid. OK, we know I’m getting drunk regardless. But here’s hoping Richmond represents. Getting so drunk for this one, chasing wings with pints of beer 4:05. Boo-yah. Last year, I think Richmond was better suited for a guy you’d throw in for 2-3 innings of work (kind of like Jason Frasor). He can go the distance and pitch 5+ innings, I just hope he can put up quality numbers today. Wings + Beer + 4:05pm start time = greatness. Wings + Beer + 4:05pm start time + record breaking rain delay = seeing double by the 6th inning! In my opinion, Richmond only made one meaningful mistake re-pitch location today, and that was the one Hafner hit off the fence…it got a little too much of the plate. The home run ball to Hafner was pretty well located, but he still managed to turn on it. Scott'll keep that in his book for the future, but sometimes you gotta tip your hat!! It was obvious that Richmond's front foot was slipping on the slick mound as he delivered, [something that didn't bother the smaller, lighter, soft throwing Lewis,] but I think that in the first inning Richmond needed to use more variety in both location and pitch selection, instead of just pounding the ball inside to the lefties. Considering the quality of his curve ball and changeup, a couple of well timed deliveries of this ilk, might have had the effect off keeping the batters off balance, instead of sitting on that inside cutter or FB. Overall, I don't think that Richmond did his reputation any damage, [he's known as a quick study & is soaking up info from every outing,] but when you consider how so many of the league's aces have had their heads handed to them already this season, I think that Richmond did OK and stayed true to his purpose, to keep his team in games. Nevertheless we were treated to a strange, fascinating and rather excitng, very long game, with the best of outcomes. Renaissance Man, very good observations. Richmond obviously wasn’t pitching in ideal conditions, so his numbers for Friday’s game were a little squewed. But for his first game of the year, I’d say 3 ER isn’t so bad. That’s almost a quality start anyway. You’re right, so many #1 pitchers like Lee, Sabathia, Verlander, Webb have all had bad first starts … and Richmond is holding up pretty well so far. Like I said, he can pitch the Jays far enough into the game and keep runs off the board, so long as he gets the run support Richmond will be fine.